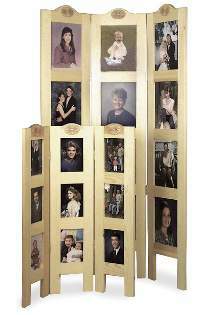 This plan shows how to build both a small and a large three-section screen to show off your family photographs. The small screen holds nine 5 x 7 photographs and measures 33"H. The large screen holds twelve 8 x 10 photographs and measures 57"H. Both projects use double acting hinges which allow you to fold each section either in or out. This allows the screen to stand alone or fold flat for convenient storage. Patterns drawn FULL SIZE. Photo Screen Hardware Parts Package Includes two pair of double-acting hinges, turn buttons and three embossed birch ornaments. #1617 package includes nine 5 x 7 acrylic photo windows. #1618 package includes twelve 8 x 10 acrylic photo windows.